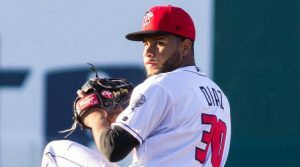 Right-handed pitcher Yennsy Diaz is putting up big numbers in his second season with the Lansing Lugnuts. Currently ranked third in the Midwest League with a 0.88 WHIP; Diaz has been tough on opposing hitters all season, as they’re only managing an average of .110 against him. The righty also uses a curveball and a changeup in his repertoire to keep hitters off-balance. And keeping hitters guessing has been a common occurrence in 2018, as Diaz is averaging close to a strikeout an inning with 31 K’s in 31 2/3 innings pitched. Another component to Diaz’s success is the focus he’s using every outing in 2018. Be sure to follow Yennsy Diaz’s progress this season, and for years to come, as he continues to find success with his new focus every outing.